Department of Geography, Faculty of Arts and Social Sciences, University of Malaya, Kuala Lumpur, Malaysia. The level of the thermal environment in urban villages open spaces plays a significant role in the personal satisfaction of a city. The different weather and climate attributes of countries as indicated by their geographical location and natural conditions directly affect people's behavior and utilization of open spaces. Hence, a naturally cognizant urban structure arrangement should give high preference to the level of comfort ramifications of urban microclimate. 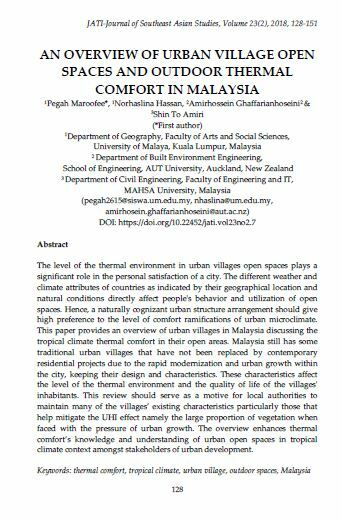 This paper provides an overview of urban villages in Malaysia discussing the tropical climate thermal comfort in their open areas. Malaysia still has some traditional urban villages that have not been replaced by contemporary residential projects due to the rapid modernization and urban growth within the city, keeping their design and characteristics. These characteristics affect the level of the thermal environment and the quality of life of the villages' inhabitants. This review should serve as a motive for local authorities to maintain many of the villages’ existing characteristics particularly those that help mitigate the UHI effect namely the large proportion of vegetation when faced with the pressure of urban growth. The overview enhances thermal comfort’s knowledge and understanding of urban open spaces in tropical climate context amongst stakeholders of urban development.